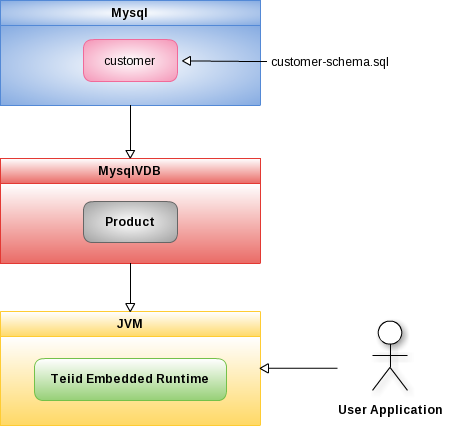 Teiid Embedded is a light-weight version of Teiid, it contain an easy-to-use JDBC Driver that can embed the Query Engine in any Java application. The Embedded mode supply almost all Teiid features without JEE Container involved, it supply a convenient way for Users who want integrate Teiid with their Application. Mysql database be used in this example, note that customer are mysql database name, it contain the customer-schema.sql tables.